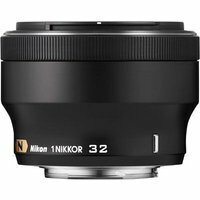 A welcome addition to the Nikon 1 range, the Nikon 32mm f1.2 1 Nikkor Lens is an exceedingly fast, compact prime lens which is simply perfect for portraiture. Its wide aperture and 32mm focal length (85mm equivalent) ensure that the lens grabs up every available photon, giving you brilliantly bright, sharp images with silky smooth bokeh. This lens is a joy to work with, even with difficult lighting: The Nano Crystal Coating and included lens hood reduce ghosting and flare, while the wide aperture makes light of dim conditions.